›KoverRoos 61352 Weathermax Large Dining Set Cover, Forest Green - 108 L x 82 W x 28 H in. KoverRoos 61352 Weathermax Large Dining Set Cover, Forest Green - 108 L x 82 W x 28 H in. The KoverRoos outdoor dining set cover is the ultimate in furniture protection. The material, design, and construction are simply the best on the market. Outdoor furniture covers need to breathe so that moisture can escape, keeping mold and mildew from developing under the cover. Koverroos use technologically advanced materials that are one-way breathable - so moisture can evaporate right through the fabric, but water, dust and dirt can't get in. Koverroos covers are stronger than most vinyl covers, yet light weight. This means our covers are easy to use - no struggling to get them on and off. Also, these patio furniture covers are able to handle temperatures from -100 degrees Fahrenheit up to +240 degrees. The Weathermax™ Large Dining Set Cover is appropriate for most weather conditions. Tyvek®, a revolutionary, patented fabric ideal for covering outdoor furniture, is extremely lightweight, and therefore easy to handle, yet surprisingly strong. Tyvek® patio furniture covers score 4 out of 5 in breathability, 5 out of 5 in dirt and dust protection, 5 out of 5 in mold and mildew protection, 4 out of 5 in rain protection, 2 out of 5 in durability, 5 out of 5 in ease of storage, and 4 out of 5 in color retention. The competition (PVC Coated Polyester) score 2 out of 5 in breathability, 4 out of 5 in dirt and dust protection, 2 out of 5 in mold and mildew protection, 4 out of 5 in rain protection, 3 out of 5 in durability, 2 out of 5 in ease of storage, and 2 out of 5 in color retention. 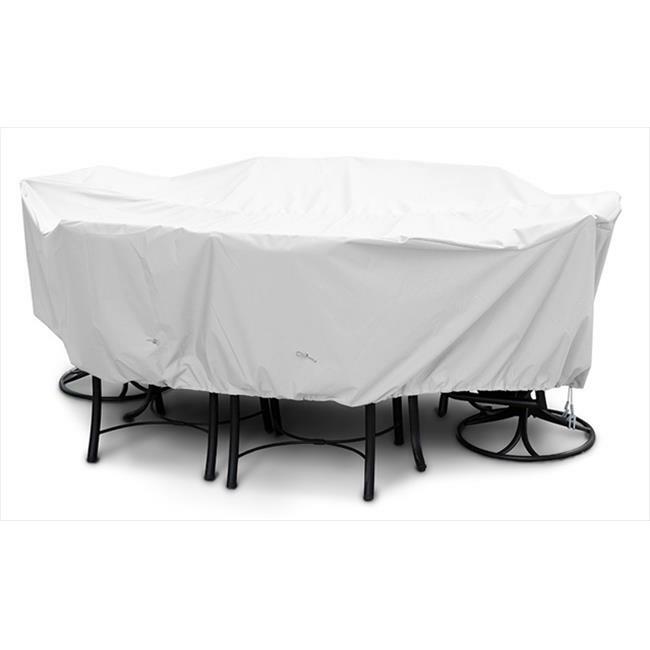 This particular cover comes with a drawstring and u shaped hook/bungee system (set of 6) attachment system in order to secure the cover in harsher weather conditions and is fitted for an outdoor dining set less than 108 L x 82 W x 28 H in.